Tonight I sat with the leadership of a congregation about a renovation project that should have been over the top exciting. The reality is that they are so concerned about the future of the congregation that the project was no more than a pipe dream. Perhaps rightly so! They are few in numbers and older attendees which is a typical story throughout our CEM geography. I also attended a church dinner tonight at a different congregation. It was extremely well attended but the age demographics was 50+ as well. I was in 2 other congregations the past 2 Sundays and the 50+ trend is prevalent everywhere. Assume you will be coached, mentored and supported by CEM in the how-to approach to reconnect with periphery members. Assume if you do not do the above, you are guaranteed to be closing your congregation doors as 20 others have in the past 15 yrs. Assume you are not alone. You will not be the first congregation to make a turnaround. Assume the time to decide to change is shorter than you think. With weak social linkages in most congregations the glue holding you together is gone. I look forward to talking with you, sharing with you, working with you to bring about change. I don't know who becomes intrigued, challenged and decisive from reading this blog. You have to call, email, respond to this blog below to let us know in the CEM that you are ready for change. On an exciting note...... This coming Sunday I am speaking in the Montreal congregation. This is the largest congregation in the CEM with attendance from 120-200 on Sundays. I understand there are 4 choirs and a band to accompany them. We are confirming 3 new members. The dynamics of worship have been described to me as exhilarating. I can hardly wait to be part of this experience. The demographics are almost all below the 50 age mark. If anyone wants to drive down with me, let me know. There is room for 3, perhaps 4. Assume you will be awed! 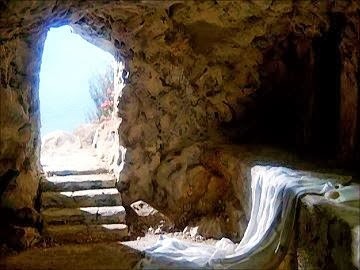 Now think about why the picture above is an empty tomb. Think congregational resurrection. I like the ideas listed. I especially like the idea of taking our present lists and doing the age exercise with it. We will find we already have contacts that just might be interested in the 21st century Community of Christ. I also like the idea of visioning for a plan instead of just accepting what we always have done. I also believe in prayer. How about a prayer vigil for weeks ahead of plans to do some outreach, God does marvelous work. It all has to do with being intentional and "lifting our eyes beyond the horizon". Thanks for sharing this blog.